Invited mentors, the presidents of venture companies, are answering the questions at UNIST Entrepreneurship Week Event. 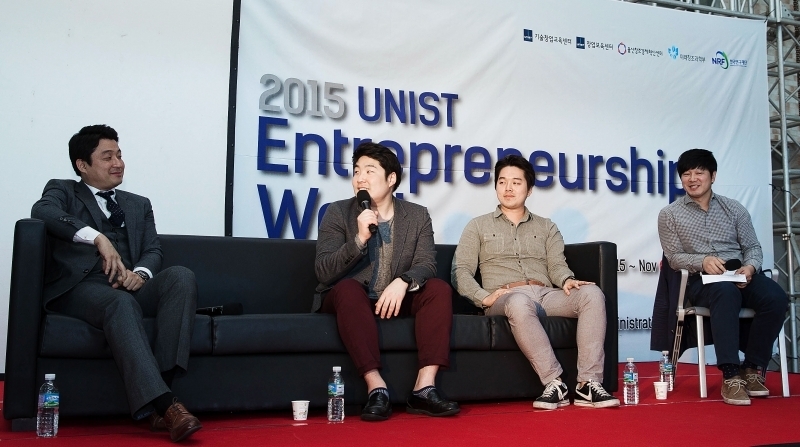 2015 UNIST Entrepreneurship Week was hosted from November 4 to 6. The ‘2015 UNIST Entrepreneurship Week’ was hosted from November 4 to 6 on the lobby of Business Administration Building at UNIST. The main purpose of this event was to train participants who want to start business in natural sciences and engineering areas. Around 100 students who are interested in business establishment participated in the event. National and international experts from business start-up area gave lectures as the mentors of students. During the lectures, mentors gave advices which were mainly focused on the specific steps of business establishment such as business plan establishment-investment plan and practice-sustainable business. This event was hosted by UNIST Center for Entrepreneurship Education, UNIST Business Incubation Center, and Ulsan Center for Creative Economy & Innovation and sponsored by Ministry of Science, ICT and Future Planning and National Research Foundation of Korea. UNIST Business Start-up Competition was also held during the entrepreneurship week. The winning team got an opportunity to go to foreign countries for study. Overseas study consists of useful programs, for example, the official visit to Strong Ventures which is an investment company of Silicon Valley, Asian Youth Entrepreneurship Program, and so on. The presidents of nationally famous venture companies including Venditz, FuturePlay, and a few other companies shared their experiences on the ideal type and reality of business establishment. They gave important tips to the students, for example, how to write a business plan that gets invested in the real business field, how to run the election of company representative without conflicts, and so on. Besides, the experts from foreign countries mainly lectured about the entrepreneurship of the global economy and the trend of global entrepreneurs. Jeffrey Lim (the head of Google Campus Seoul), Gi Hong Bae (the president of Strong Ventures), Eugene Noh (New ventures program manager of UC Berkeley) and Sung Jae Hwang (Co-founder of FuturePlay) gave lectures as mentors and talked about what global market wants from newly established companies.